Born in Jamestown, New York, Brian Fairbank developed an interest in the ski industry as a teenager visiting Lake Placid. By the time he was in his early 20s, Fairbank was a member of the PSIA Demo Team. In 1969, Fairbank became manager (and ski instructor) at Jiminy Peak. He transitioned to ownership in 1974, becoming president of the ski area. With Fairbank as President, Jiminy Peak became a four season resort, adding an alpine slide in 1977 and two new double chairlifts in 1978. While continuing to expand Jiminy Peak, Fairbank also leased nearby Berkshire Snow Basin, for the 1982-83 season. Heading into the 1990s, Jiminy Peak expanded significantly, adding two quad chairlifts, a summit lodge, and numerous real estate developments. Later that decade, during a routine round of golf, Jim Kelly agreed to sell Brodie to Fairbank and his business partner Joseph O'Donnell. The deal would close in November 1999. Fairbank and O'Donnell would own and operate Brodie under their Brodie Mountain Resort, Inc. company until they suspended ski operations after the 2001-2002 season. While the original plan had been to invest $5 million into Brodie, Fairbank and O'Donnell instead decided to put the money into the Jiminy Village Center. Snow tubing operations continued at Brodie until Fairbank and O'Donnell sold the area to Silverleaf Resorts for $2.6 million. Meanwhile, back at Jiminy Peak, a new high speed detachable six person chairlift was installed for the 2000-01 season. With a heavy reliance on snowmaking and the detachable chairlift, Jiminy Peak's energy bill was averaging thousands of dollars per day. To combat this, a $4 million wind turbine was installed in 2007. With a decent debt load, Fairbank and O'Donnell sold Jiminy Peak to CNL Lifestyle Properties on January 27, 2009 for $27 million. As part of the deal, Fairbank and O'Donnell obtained a 40 year operational lease of the ski resort. On June 15, 2010, Brian Fairbank, his son Tyler, and Joseph O'Donnell, along with financing from CNL Lifestyle Properties, purchased Cranmore. Immediately thereafter, a massive investment project was started, adding to both the skiing and non-skiing facilities. 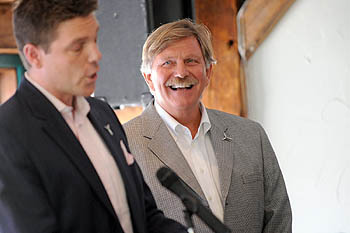 In June of 2011, it was announced that Fairbank and his son Tyler would take over the operations of Bromley.